I feel I have too much experience in the kitchen to not have tried out a Risotto until I was 27 years old...but the truth is, I had never made a Risotto until this very year. And there's always been a lot of hype regarding Risottos. Growing up, a common weeknight meal centered around pan-fried meat, a canned veggie and box of either Rice-A-Roni or Pasta-Roni. 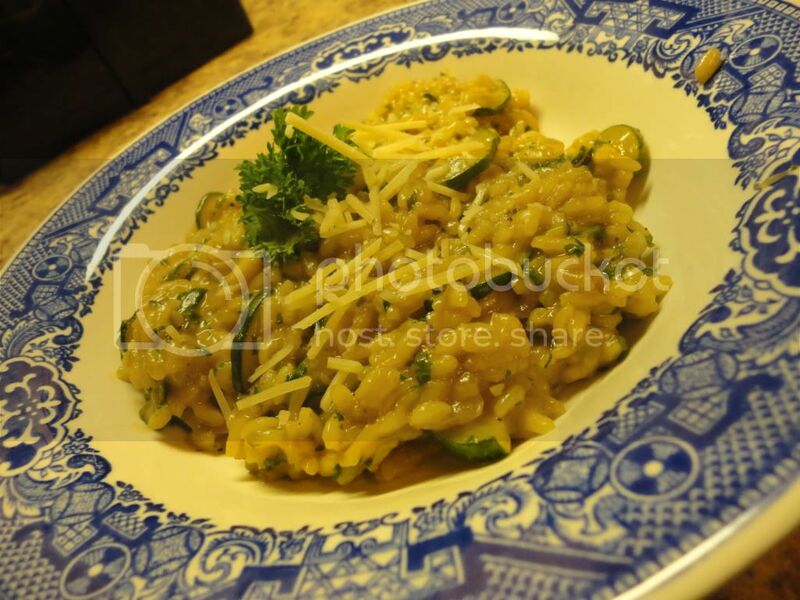 Risotto is like Rice-A-Roni. On steroids. With pizzazz. And without preservatives. Every bite was a heavenly reminder of what childhood family dinner was...or could have been. 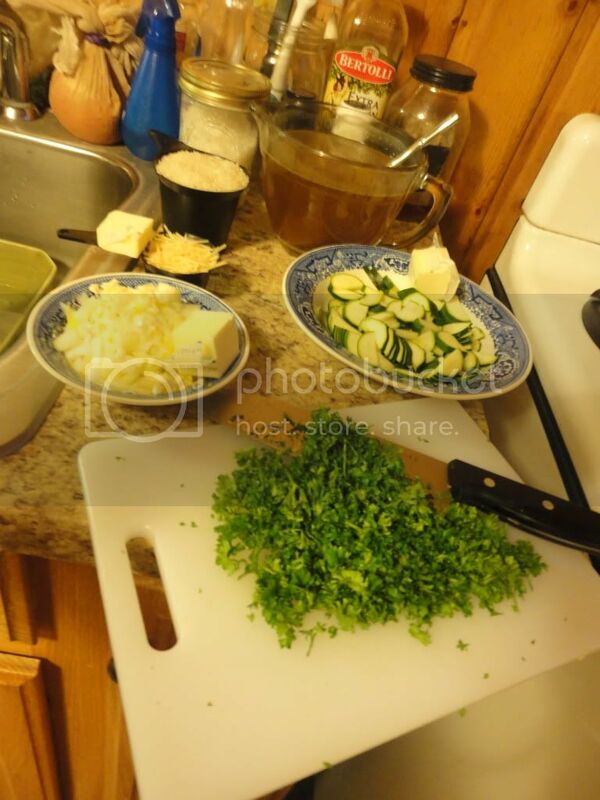 Remove stems from 3 small Zucchini and slice thinly. In a large skillet melt 2 Tbsp. Butter over medium high heat. Add the zucchini slices, saute 2-3 minutes until golden. Remove from skillet and set aside. Add 2 more Tbsp. Butter and saute 1/2 cup minced Onions and 1-2 cloves of crushed Garlic for 5 minutes. Add 1 cup short-grain Rice, saute until grains become golden. Pour in 2 cups of Broth. Cook, uncovered, stirring occasionally, 10 minutes. 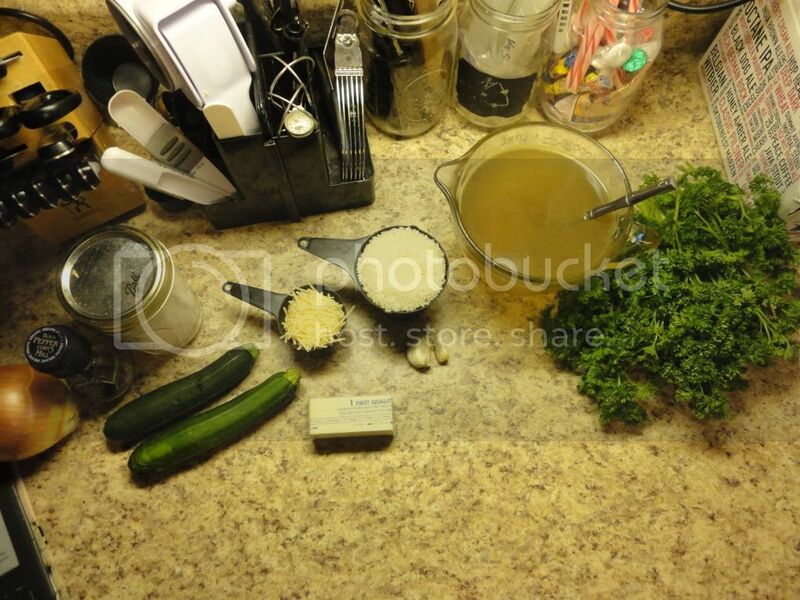 Add 1 more cup of Broth, the zuchini, and 1 cup finely chopped Parsley. Season with salt and pepper. Continue cooking until all the liquid is absorbed. Add remaining 1 cup of Broth. Continue cooking a little longer, until the rice is just tender. Stir in the remaining 1 Tbsp. Butter and 1/4 cup grated Parmesan Cheese. Serve while still moist and creamy.